The US Department of Justice will investigate whether FBI agents spied on President Donald Trump’s 2016 election campaign for “inappropriate purposes”. In a tweet, Mr Trump said he wanted to know whether his predecessor’s administration ordered such a move. The call comes after US media reports suggesting the FBI had an informant meeting campaign aides. US Deputy Attorney-General Rod Rosenstein said action would be taken if any infiltration was found. “If anyone did infiltrate or surveil participants in a presidential campaign for inappropriate purposes, we need to know about it and take appropriate action,” Mr Rosenstein said in a statement. There is already an investigation into all aspects relating to Mr Trump’s campaign for the 2016 election and whether Russia tried to influence the outcome. Mr Trump’s latest demand came amid a series of tweets on Sunday denouncing a “witch hunt” that, he said, had found no collusion by his campaign with Russia. 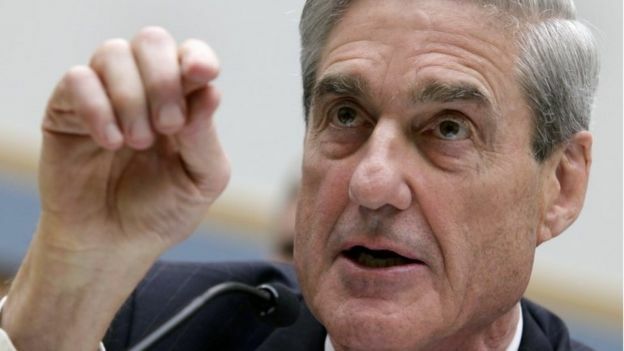 This refers to the ongoing investigation led by Special Counsel Robert Mueller into Russia’s efforts to interfere in the 2016 US election, whether there was any collusion between the Kremlin and Mr Trump’s election campaign and whether the president tried unlawfully to obstruct the inquiry. Mr Trump has constantly attacked the inquiry. Was there a mole inside the Trump team? Mr Trump first made the accusation that the FBI had sent a spy into his campaign team on Friday. The New York Times followed with an article that suggested there was, indeed, an FBI informant – whose identity it did not reveal – who had been sent to speak to campaign aides but only after the FBI had received reports of “suspicious contacts linked to Russia”. The informant – an American academic working in the UK – had made contact with George Papadopoulos and Carter Page. The Washington Post reported a similar account. Law enforcement officials have refused to provide evidence to Congressional leaders over the issue. They have argued that doing so would put the informant’s life – or that of his contacts – in danger. Mr Trump could order the US Department of Justice – which has oversight over the FBI – to release the documents. Robert Mueller appears to be expanding the scope of his probe, and Donald Trump isn’t happy about it at all. A New York Times article that seems to have prompted the president’s Sunday tweet-storm: reports that the special counsel team is looking at attempts by Middle Eastern nationals, including citizens of Saudi Arabia and Israel, to offer assistance to the 2016 Trump campaign. Such foreign involvement in the US electoral process would be illegal. After denouncing the New York Times, the president lashed out at Democrats and turned his Twitter guns on his own justice department. The president has tweeted similar official-sounding directives before with little follow-up action. If the president is serious, however, it could constitute an unprecedented attempt to influence a justice department investigatory process that has been insulated from presidential meddling since the Watergate scandal of the Nixon administration. The president clearly believes the intelligence community is conspiring against him. In his mind they are bedevilling his friends and going easy on his enemies. He wants it the other way around. What is the informant’s connection to Mueller? According to the Washington Post, the informant has been aiding the Russia investigation since before Mr Mueller’s appointment a year ago. The FBI opened the inquiry in the middle of the election campaign in July 2016. But it remains unclear how the informant first came by the information that led to his meetings with Mr Papadopoulos and Mr Page – and his wider role as an FBI informant. As for Mr Mueller, the former FBI head has so far charged 19 people. Mr Papadopoulos has pleaded guilty to lying to the FBI about the timing of meetings with alleged go-betweens for Russia. But Mr Trump and his supporters have multiplied their attacks on the special counsel’s work. Without providing any evidence on Sunday, Mr Trump demanded a stop to the inquiry – that he said was nearing $20m in costs and was composed of 13 “angry and heavily conflicted Democrats”. Mr Mueller is a Republican.